Color: They are dull gray as adults and the larva is cream colored and greasy looking. Characteristics: Their faces have 2 velvety strips, silver above and gold below and their thorax has 4 narrow stripes. They have pale sides on their abdomen with sponging mouth parts for feeding. Size: House flies are usually about 1/8 of an inch to 1/4 of an inch long, with the female generally larger than the male. House flies are dark gray in color, they have 4 distinctive black stripes on their thorax and two “velvety” silver and gold stripes on their face, and they have an oval shaped body. Adults can grow to be ¼ of an inch in length; females are larger than the males. House fly bodies are covered in small fine hairs that function as their taste organs; they have compound eyes that allow them to see in many directions at the same time. Their larva are cream colored, eyeless, and they taper from the rear to the head. Why Do I Have House Flies? House flies invade homes while looking for food, water, and a safe breeding area. House flies are attracted to such a wide variety of food sources that it doesn’t take much to attract them to a property or home. House flies are also looking for damp, dark areas to lay their eggs in. A female house fly can lay over 150 eggs at a time, and will lay about 5-6 batches over a few days. Compost piles, mulch, excrement, and carcasses can all serve as breeding areas for flies. How Do House Flies Differ From Other House-Infesting Flies? House flies are considered to be filth flies and are more than just a nuisance to have flying around your home, they can carry and mechanically transmit a wide variety of dangerous diseases. Other flies that invade homes like fruit flies are more of a nuisance and while they can still carry diseases they are not quite the threat that house flies and other filth flies are. What Are The Feeding Habits Of House Flies? House flies can only consume liquids because of their spongy mouthparts. House flies will liquefy any solid food that they wish to feed on through regurgitation. 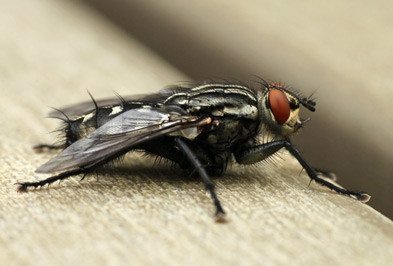 House flies are scavengers and feed on a wide variety of food including pet food, human food, dead animals, garbage, and excrement. What Threats Do House Flies Pose? House flies pose a lot of threats to homeowners because they carry and transmit a wide variety of pathogens including but not limited to salmonellosis, diarrhea, dysentery, polio, parasitic worms and typhoid fever. Pathogens will collect on the legs and mouths of house flies. When they land on a new surface like your kitchen counters, utensils, or food they will quickly and easily spread the those dangerous pathogens. Also, house flies regurgitate and excrete whenever they come to rest which only increases their identity as a filthy and dangerous pest. House fly control requires knowledge of breeding locations and larval development activities. The professionals at Holder’s Pest Solutions are trained to identify these locations and know exactly what fly control treatments to use to help eradicate these pests. They can show you exclusion techniques and environment modification tactics to help keep these pests from returning. If you have house flies in your home or business and are looking for a qualified pest control company to eradicate these pests, contact the professionals at Holder’s Pest Solutions today for more information. How do you prevent a house fly infestation? Making sure that garbage is being regularly removed from your home and that it is stored outside in a trash can with a tight fitting lid until trash day. If you own pets make sure to regularly pick up their excrement from your yard. Check that all window and door screens are tight fitting and intact. Seal cracks and crevices found in your home’s foundation or exterior walls. Store food in the refrigerator of your home instead of out on counters or tables. Routinely wash your dishes, do not leave dirty dishes in the sink for long periods of time.